The Post-it dress is done! I love it! It’s so hard to capture the colour of this fabric, but it really is Post-it note colour! It was absolutely filthy to sew because the fabric writhed, wriggled, slithered and morphed to an incredible degree. 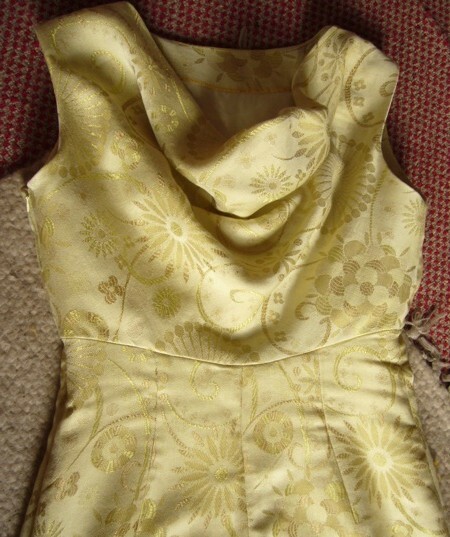 In the end I had to tack the interlining to the brocade just to cut it out, then overlock the two together, and then tack the whole dress together to sew – pins just weren’t doing the job. I don’t love the fit in the sleeve which is tight at the front and loose in the back – but he’s not planning to conduct orchestras or communicate via semaphore in the thing, so a full spectrum of movement is not mandatory. Otherwise, I think it came up a treat and he picked the purple buttons himself (actually, he has an unexpected talent for picking buttons. 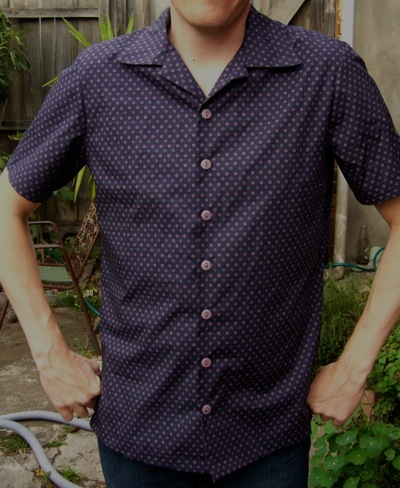 I consult him on almost every garment because he picks the buttons I never would and they’re usually perfect). One day I’ll remember to widen the shoulders so he doesn’t get those wrinkles under the collar. NOW. Moving right along. As foretold in the previous post, there’s a contest entry to prepare! 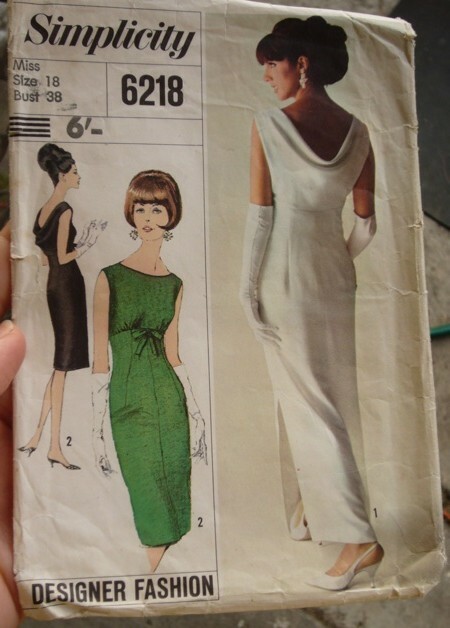 I picked Simplicty 6218, a stunner of a 60s sheath gown with a cowl back and empire line. 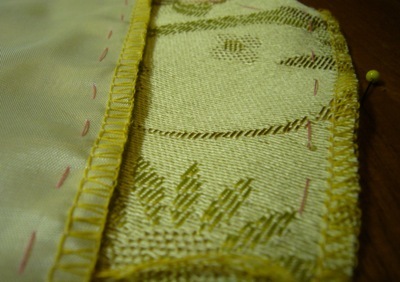 I’m making it in a simmery, drapey 1960s brocade that is the precise colour of Post-it notes. Or pus, if you’re feeling earthy rather than proprietory. But the ‘Pus Dress’ doesn’t quite have the same appeal as the ‘Post-it Dress’ somehow. Can’t think why. 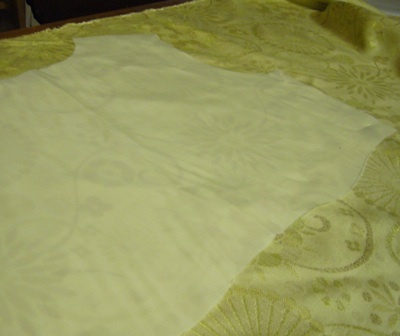 This is the lining that I’m working on first and I’ve had to mess with the contrast because the fabric is a similar colour to the tissue. The important thing is that you shift it precisely on the grain line (when you’re cutting on-grain) OR along the central axis if you’re cutting on the bias. Then, with a ruler, you need to draw new side cutting lines from the top edge of the pattern to the edge of the original placing of the lower seam. You can see this above on the piece to the right. I’m also narrowing the neckline by 1cm because I have very narrow shoulders. I hope this is enough! 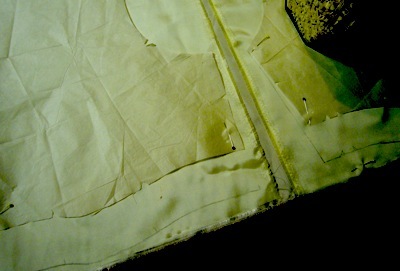 This pic shows the front and back bodice pieces together at the shoulder seam… obviously the alterations have to match exactly here. Now we move onto the vintage brocade. This is the cowl piece which is cut on the bias for drapeyness. I’ve added 5cm here too and redrawn the side seam… yup, I know this looks like a very different angle, but it’ll all be OK, I promise. 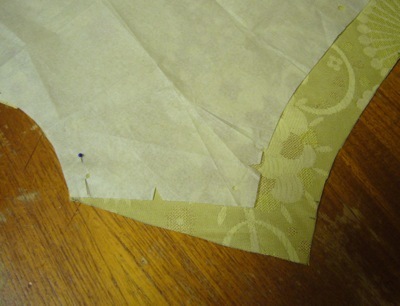 Now I’m using the lengthened lining piece as a pattern for the brocade. And it’s a bit sheer, allowing me to artfully cut a bodice piece that avoids the horror of accidentally landing a target-shaped motif slap-bang front and centre like some glorified aureola. 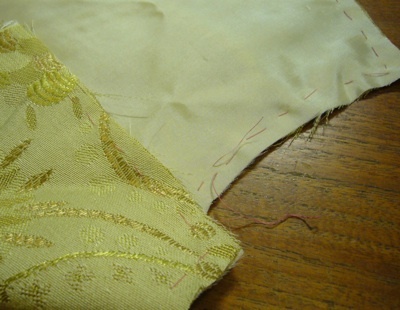 I’m not doing a true lining; I’m sewing the two fabrics together (interlining). But because one is so slippery and the other writhes and wriggles about, I’m basting them together…. 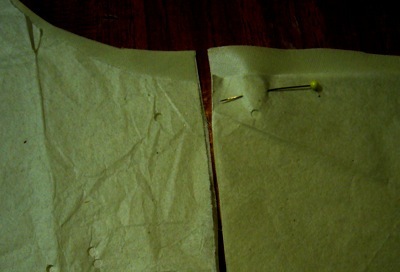 …and then overlocking the straight seams since these synthetics unravel like the dickens!. Phew! Next steps… well, I’m going to muslin the skirt because I have an awful feeling I might not have enough fabric… eek.